What has purple legs, green arms, and a great punchline? Your Halloween costume this year! It's great to feel like a genius and look fabulous at the same time. You know, too many superhero movies dwell on strength and weapons, completely ignoring the most important part of a plot. . . smarts! Are you the kind of person that jumps for a pencil and paper as soon as a word puzzle comes on the radio? Are you always annoying your friends with nonsensical questions that have puns for an answer? We get you. There's something that comes alive when you're figuring out a puzzle. That thing that comes alive led the Riddler to a life of twisted crime but hopefully, you'll just stick to Sudoku. Have you ever wondered where The Riddler got the time and resources to build his death traps? In our neighborhood you can't even put up a fence without a permit from the city not to mention constructing a deadly maze. Maybe if Gotham focused more on everyday licensing maintenance they could cut down on crime, put Arkham out of commission via health and safety violations. The Riddler would find a way around the red tape, though. He's just that smart! Are you ready to become riddle royalty? The princess of puzzles? The monarch of mazes? Well then, this costume is probably for you. This outfit features the green question mark jacket with cropped shirt front and tie. You'll look sharp in the purple tights that match the gloves and face mask. 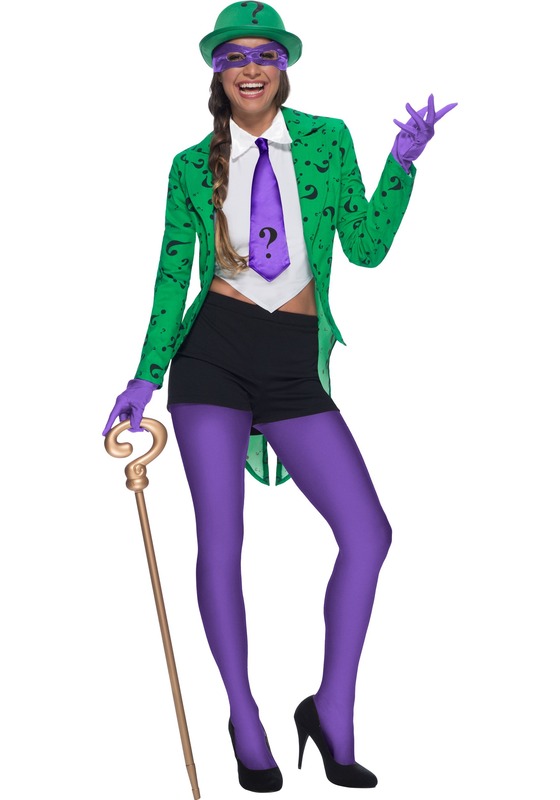 Top the costume off with the included question mark cap and pair it with the Riddler cane and you're sure to make a remarkable entrance! Who wears a cape and is green with envy? That's easy, anyone who dressed as a superhero this year!